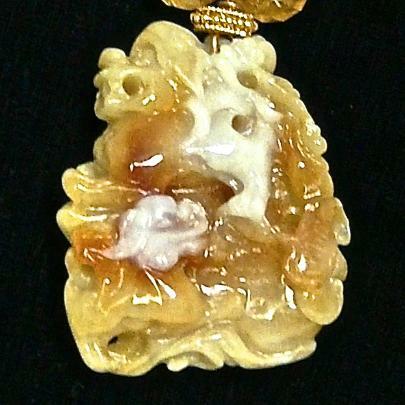 Approx length 18", pendant 2" X 1 1/2"
This fabulous piece of natural jade has many colors in it. The artist who carved it has used the colors to emphasize the carvings of the two fo dogs - one on the top and one white a white face in the middle of the piece. The carving is very detailed and continues on to the back of the piece. 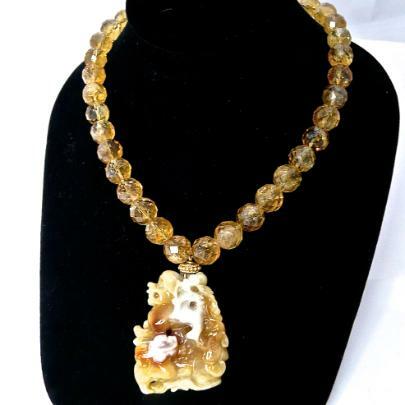 I have beaded this with faceted citrine beads that pick up the color of the jade. It is finished with a large 18k gold vermeil clasp. The Fo Dog is believed to be very protective, discouraging evil people and/or spirits from entering the place they guard. The fo dog or temple lion have traditionally stood in front of Chinese Imperial palaces, emperors' tombs, temples, government offices, and the homes of mandarins and the wealthy. The fo dog is symbolic of vitality, courage and loyalty. Usually they are created in pairs – a male and a female. 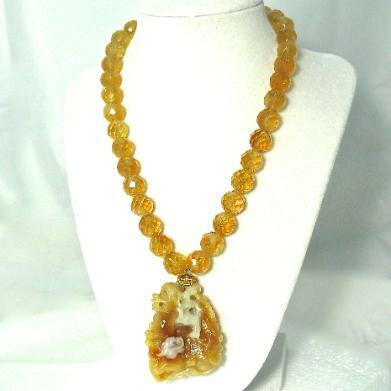 Citrine is a yellow to golden variety of quartz and is the birthstone for November. 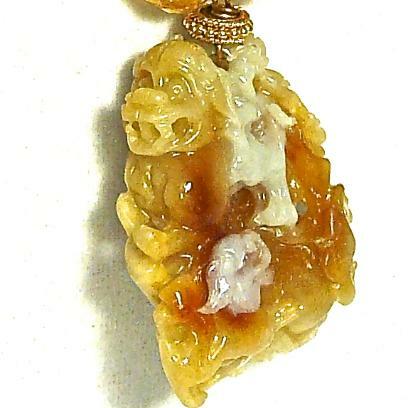 Citrine is believed to be a stone that brings good fortune, especially to those in sales.